Home › Results › 2012-13 › Inter Area Youth Championships – Report – NW defend title! Inter Area Youth Championships – Report – NW defend title! 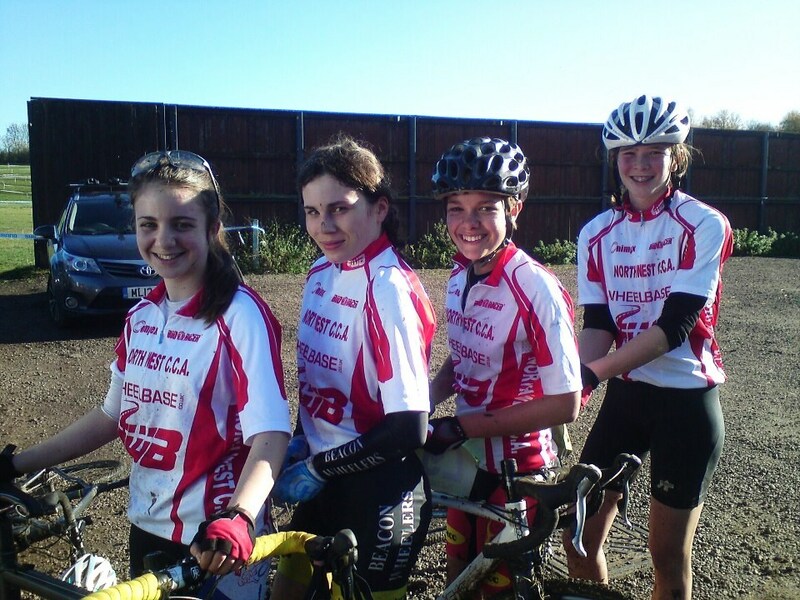 The North West girls returned to the Milton Keynes bowl on Sunday 11th November to try and defend their title as the Inter Area Youth Championships. After an early start and a journey down to the Midlands, Martha Gill, Henrietta Colbourne and Jessica Wilkinson were ready to race as they had last year, with a 4th addition in the form of Rosa Martin! Last minute preparations of checking tyre pressures and number pinning were completed and the team went to check out the new course. It was made up of long repeated hills and drags with snaking corners up and down as well as a few slippy running sections. A final drink and warm up was followed by the team gridding. They were ready! The whistle blew. All 86 riders clipped in and thundered along the tarmac to the first drag where the bunch began to string out rapidly. With boys flying everywhere, the girls steadily moved up the race where the leading girls were in sight. After a few inclines Jessica connected to the front in a group of 5 and moved comfortably into 3rd as the tough course took its toll. Martha’s fantastic start and experienced mountain biking skills played to her advantage as she rolled smoothly over each corner, reeling in the riders ahead. She soon had herself placed firmly in 4th position, where she would remain for the duration of the race. Meanwhile, not too far behind was Henrietta who was also making the most of the course, riding effortlessly up the top 10. She continued to ride brilliantly and carried on catching riders throughout the race. Rosa Martin, who like Henrietta is still a first year U16, was securing more vital points for the North West total. Even after taking a hard fall joining from the grass to tarmac didn’t get the better of her. She picked herself up and rode a brave race to support her team. The mud gradually got even slippier and it was Jessica who took the next tumble, misjudging one of the many greasy corners. The 2nd place rider moved even further away but with support from the pit crew duo Clive and Karen she moved ever closer, before eventually catching her on the penultimate lap, moving into 2nd place. Martha and Henrietta were next over the line, securing top 10 finishes of 4th and 7th. They were soon joined by Rosa and it was smiles all round as they learnt how well they’d done. A quick bucket wash and then change in Martha’s spacious van was followed by a podium presentation. 3rd place: Yorkshire… 2nd place: Wales… and 1st place: NORTH WEST! They had successfully defended their titles as the Inter Area Youth Champions! The afternoon was topped off with the veterans’ race in which Dave Headon, Sean Beswick, Mark Ferguson and Pete Middleton had their turn on the gruelling circuit. The girls jumped in for a bit of pitting as the vets rode a fantastic race, securing a 7th place overall. A vast improvement from last time!